Folding Voice workshops and training on aging and lifespan, diversity and inclusion, and leadership and workforce are designed with strategy in mind. 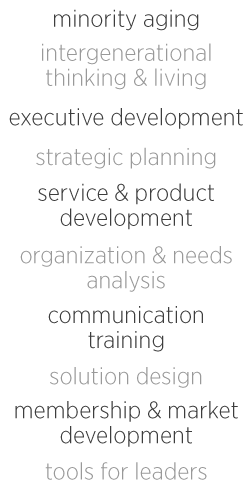 As stand-alone modules, as a multistage personnel development plan, or as part of a strategic solution Folding Voice workshops and trainings convey the information and skills that help people see, solve and act. We always deliver a blend of conceptual knowledge and practical skills. Workshops lean more toward knowledge development. Folding Voice training will involve more practice and skill development. We also develop customized, hybrid workshops and trainings. Our core offering is the Folding Voice Studio, a single or multi-day event delivered as a workshop or training.